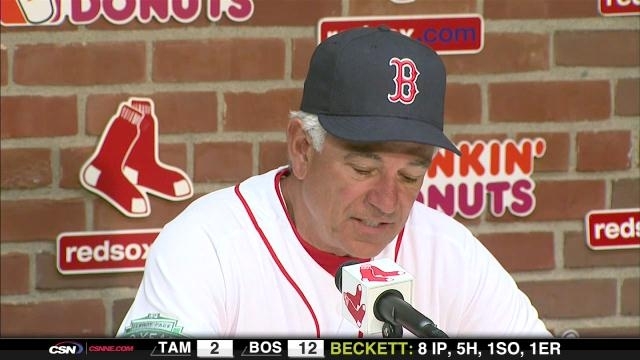 Sox Manager Bobby Valentine called out Kevin Youkilis for not being into the games physically and emotionally - after sweeping the Tampa Bay Rays. Say what? McGILLIGAN: This better be some type of genius managerial strategy Bobby Valentine picked up in Japan because that’s the only way his Sunday night comments make sense. Kevin Youkilis struggled in the first two series of the season. There weren’t many Boston Red Sox that didn’t. However, Youkilis hits in a coveted spot usually between Adrian Gonzalez and David Ortiz, so his value is high for a team expected to have one of the best offenses this year. So when he turned it around in the past three games – all wins against the Tampa Bay Rays – things seemed to be swinging in the Red Sox favour. Then came the out-of-nowhere criticisms of Youkilis by Valentine following a 6-4 win on Sunday. In three-straight wins, Youkilis is hitting .400 with three RBI and six runs scored. Prior to the three wins he was 2-20 with six strikeouts and 10 men left on base for a club that went 1-5. This is why Valentine’s comments make no sense. If you criticize a guy in the media, it usually occurs when he’s playing poorly and the team is struggling, not when things are going good. Another oddity of the statement is Youkilis “not being emotionally into the game.” This is something no one has ever said about the Greek God of Walks (to be fair I referred to him as the Greek God of Walking Back to the Dugout during his early struggles). The statement led to some interesting comments from Red Sox leader Dustin Pedroia. Youkilis said he was confused by Valentine’s comments and said it wasn’t how he saw it. For his part Valentine apologized to Youkilis and offered this explanation on MLB.com. “I answered the question that, I think the question was, ‘It’s not Youk-like the way he’s playing.’ I think that was the question I answered,” Valentine said. “I should have explained that his swing isn’t what he wants it to be. The physical part of his swing is frustrating. Frustration leads to emotion. I haven’t seen him break as many helmets as I’ve seen on TV. It just seemed different. The key statement is “I haven’t been here long enough.” I won’t pretend to know the intricacies of major league managing, but if you haven’t been there long enough to form an opinion why make a statement. This may amount to nothing in the end, but isn’t it too early for the manager to be apologizing for statements (non-Castro related) and team leaders having to step in and defend teammates. Perhaps this is a strategy Bobby V is employing that will have long term benefits and I will look back and call him a genius. Perhaps. One thing is for sure, there’s not going to be a dull moment this season in Beantown.